I will occasionally hold dolling or other art contests here. 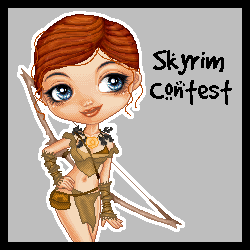 Click the image to be brought to the contest page. My contests are judged by a judging panel that consists of two dollers and by two people who know nothing about dolling. If there are enough entries there is also a peoples choice poll. Create a doll using at least five items from the list. Doll any Skyrim inspired character! The world needs more Skyrim dolls! Make a pirate or a steampunk (or both) inspired doll!